Zeppole is a traditional pastry widely recognized in Italy, parts of Europe, Canada and the U.S. It is closely associated with the spring and Easter seasons around the celebration St. Joesph's Day. Zeppole: The famous Italian pastry that keeps on creating family traditions. The idea of a donut is a very different concept to any individual, depending on where they grew up. In North America, franchise style outlets have commercialized the production of donuts to take advantage of automated equipment, less expensive ingredients, and flavour additives that can range from powdered whip cream to multi-coloured sprinkles. Some traditions hold long though, in spite of the onslaught of massive commercial production. Zeppole is one of those traditions. With many traditions, those most enduring are often borne of their connection to religion, and in that, zeppole is an intricate part of St. Joseph’s Day which is a holiday celebrated by Catholics, Lutherans, and Anglicans on March 19th also referred to as the Feast of St. Joesph. Italians, Poles, Spaniards and transplanted North Americans celebrate this day commemorating Saint Joesph – the husband of the Blessed Virgin Mary, father of Jesus. The day is also recognized as Father’s Day in some parts of Europe. 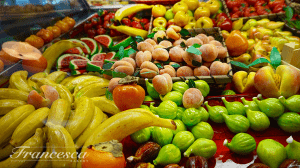 This celebration remains a family occasion in many parts of the US and Canada among Italian communities, where traditional cooking and food becomes the event itself. Oh yes, and church too! 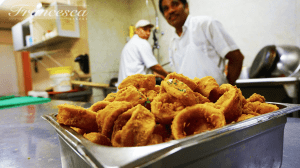 St. Joseph’s Day is why zeppole are connected to the spring season and Easter Holiday – in Europe they are actually called Zeppole di San Giuseppe – referring to the Holiday. 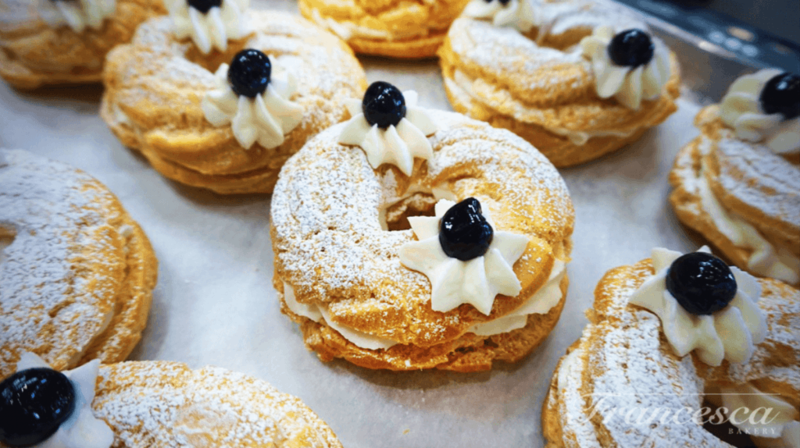 Many North American bakeries of Italian influence offer zeppole during all Holidays, and perhaps even all year round, but you can be sure they will have them in March and April. Although found all over Italy, Naples is frequently thought of as where it all started as they were sold on streets and offered as gifts. However, they are also very popular in Rome and Sicily as well as regional variations such as Croatia where they are called “blenzi.” The Republic of Malta in the Mediterranean (below Sicily) also make a savoury version flavoured with anchovies, so there is definitely some creative flair among different countries and states. What pastry is used to make zeppole? The base for the zeppole pastry is a basic choux paste or pate a choux. You will know this pastry because it’s used on other more common pastries such as cream puffs, eclairs, beignets, and the lesser-known profiteroles and croquembouche. The characteristics of this pastry are the tender but slightly chewy outer crust, and the very airy interior which lends itself to being injected with light fillings made from flavoured whip cream. Pate a choux is made from approximately 1 part of each milk, water, butter, and flour which is worked together over heat, then removed while 2 parts of whole eggs are vigorously stirred into the mixture. It’s this stage that sets the pastry apart and offers characteristics that work well with light fillings. 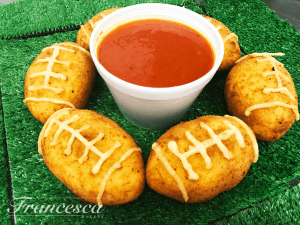 Adding the eggs as a finishing step creates a glossy dough that is thick, but yet fluid enough to shape into many creative pieces like leaves, swirls, bird wings, balls, and rings. The egg also helps create an outer seal during the cooking which results in large pockets of air inside. 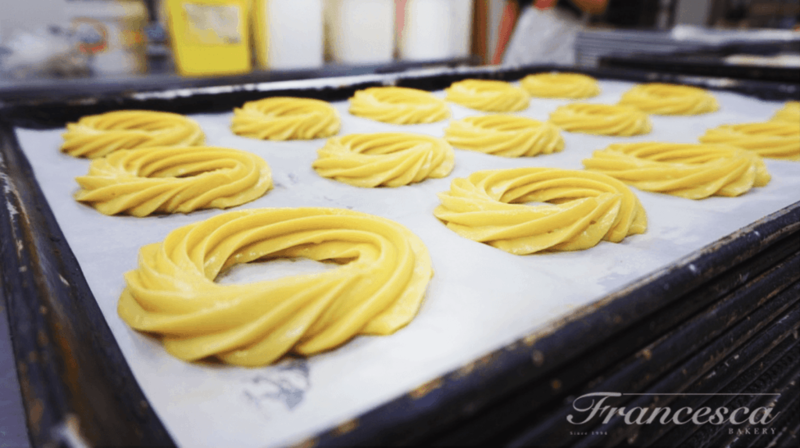 Once in the oven, the choux paste rings can increase 2 to 3 times in size becoming a light brown and airy light texture inside. They are then cooled and sliced through the middle creating a top and a bottom layer. The filling is piped in a circular motion around the base layer of the ring, and then the top layer placed gently over the filling, leaving the waved edges of the pastry for show. 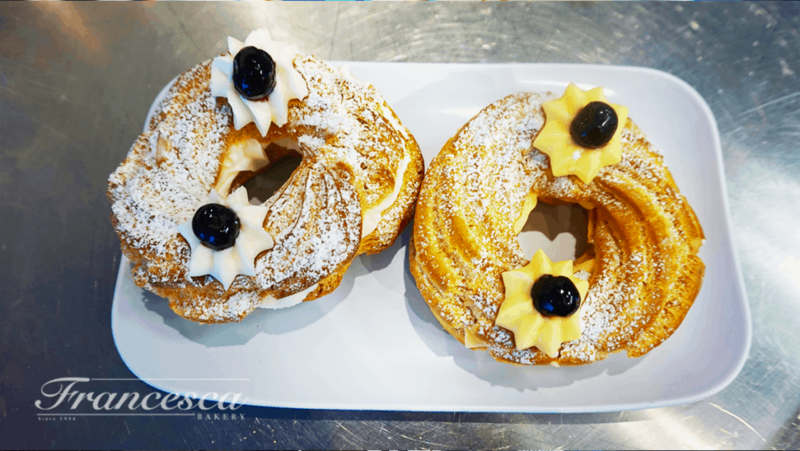 Decorating a zeppole often consists of adding two dollops of the same filling on top, adjacent from each other, and then a generous dusting of icing sugar. 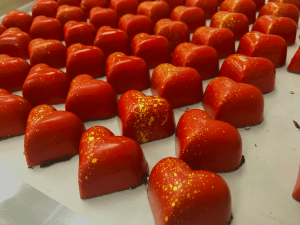 Also, in the Italian tradition – especially for the vanilla flavoured fillings – a large marinated black Amarena cherry is nestled into each dollop. This last garnish is as much a beautiful contrast in colours as it is a flavour burst – for at least two bites. What are the fillings for Zeppole? The traditional zeppole fillings are either a chilled custard mixture or a cannoli-like ricotta cream. From there, flavourings are limited only to the baker’s creativity. In keeping with Sicilian tradition, we have a beautiful pistachio zeppole this year that combines fresh ground pistachios and vanilla custard filling to produce a wonderful nutty flavour and intense colouring. Then we top it with confectionary sugar and two more dollops of custard. 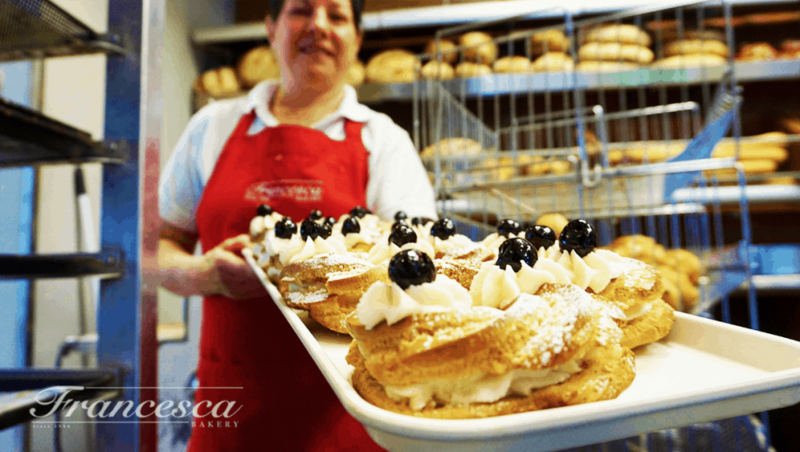 Francesca Bakery makes Italian, European and Canadian foods and desserts and just like the zeppole, ours are made by a team of dedicated bakers and professionals using top quality ingredients and hand-made craft. 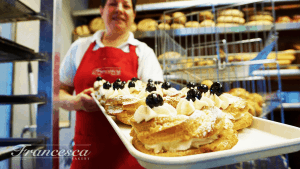 Zeppole are available by the single, half-dozen or full dozen orders, but for large orders it’s best to call ahead – particulalrly during the spring season.